The 2017 Junior League of Westchester-on-Hudson Annual Holiday Boutique will be held under the tent and in the Carriage House at Lyndhurst. Over 55 vendors of unique and fine quality gift items will be participating. And for gift-giving inspiration, check out Lyndhurst mansion. 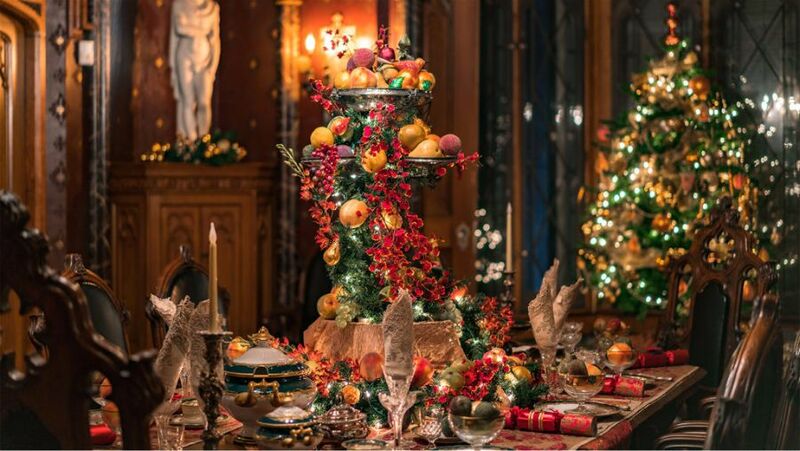 Lyndhurst goes all out for the holidays, elaborately adorned with an over-the-top display of holiday ornaments that also pay homage to a real French duchess, Anna Gould, the Duchess of Talleyrand, the last owner of Lyndhurst. We’ll view the magical holiday lighting on Tarrytown’s charming Main Street, the Main Street of your memories and dreams – and of the movies. You’ll probably feel right at home since many movies you’ve seen have been filmed on this historic street. You can do some old-fashioned Christmas shopping in its unique independent stores while taking in its beauty, including a Tiffany stained glass window and the historic Queen Anne-style Tarrytown Music Hall.